Measuring Ecosystem Responses To Water Availability: How Dry Is Too Dry To Hinder Evapotranspiration? Drought is one of the most devastating natural disasters that can cause serious agricultural, economic, and social impacts around the globe. 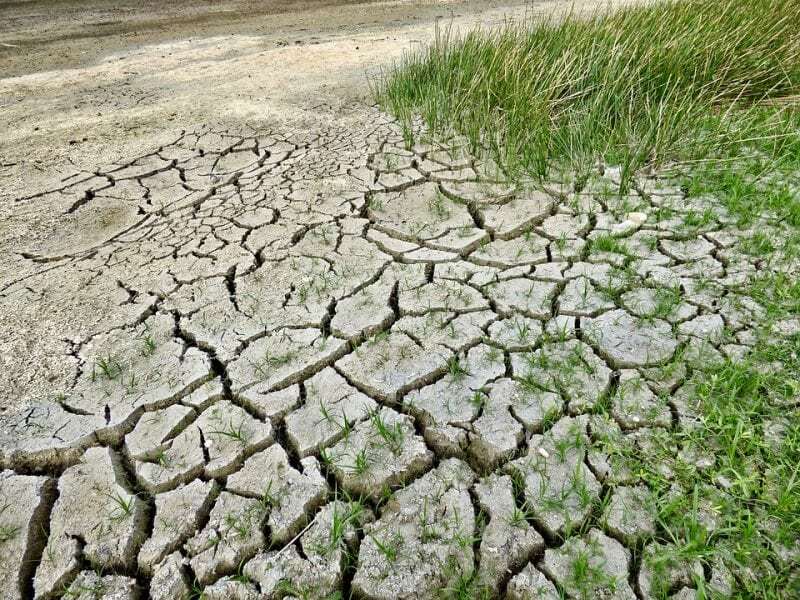 Several studies project increased aridity over land and more widespread droughts associated with the changing climate, which could have profound impacts on agriculture, ecosystem service, and human welfare. Yet, most of the existing drought monitoring indices are based on drought stress derived from environmental conditions rather than actual ecosystem responses, neglecting potential feedbacks between biosphere and atmosphere. However, studies have shown that differences in ecosystem resilience would contribute to diverse adaptation and acclimation mechanisms in regards to limited water availability. Chang et al. (2018) presented an ecosystem drought indicator called the Normalized Ecosystem Drought Index (NEDI) that can measure drought severity to relate the effects of ecosystem responses to limited water availability. The main difference that distinguishes NEDI from the existing drought indices is the use of normalized surface water balance in quantifying drought conditions, which incorporates ecosystem characteristics in drought severity estimation. They hypothesized that the amount of water accessible to an ecosystem (W) is the difference between its precipitation and potential evapotranspiration (positive with water surplus), neglecting the effects of groundwater storage and runoff. The NEDI was then defined by normalizing the water availability series with its maximum absolute value, which would be ranged from −1.0 (driest condition; maximum water shortage) to 1.0 (wettest condition; maximum water surplus). Based on this approach, the wet/dry status of a given ecosystem can be derived with the measurements of air temperature and precipitation that are widely accessible at standard weather stations. In their study, ecosystem responses to drought were depicted by the measured changes in normalized evapotranspiration strength (hereafter K), defined as the ratio between actual evapotranspiration and potential evapotranspiration, to facilitate the comparison of drought severity across different geographical regions among various ecosystem types. 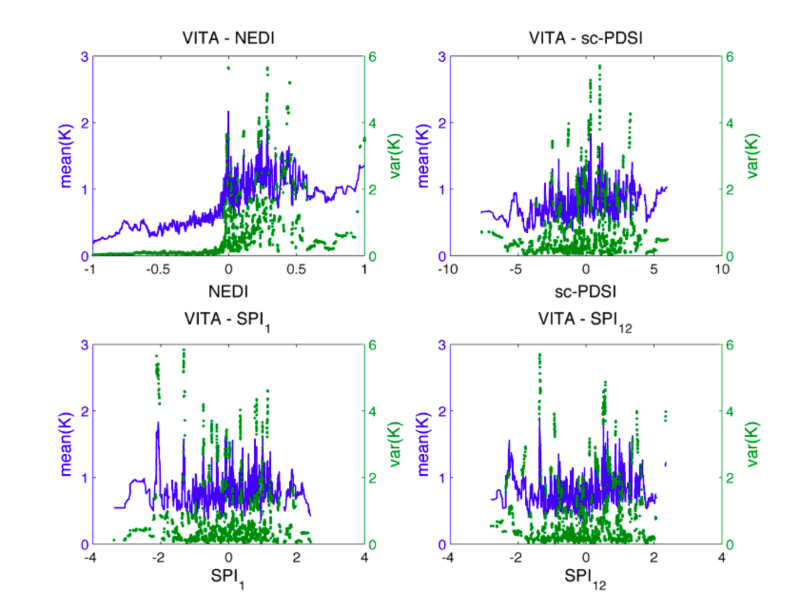 When represented in variable space (Figure 1), there is a rapid transition signal in the localized variance of K when NEDI changes sign, suggesting that ecosystem responds differently to water availability between wet and dry NEDI regimes. When NEDI is positive, localized means of K are relatively high with strong localized variances of K fluctuating over the wet regime. When NEDI is negative, localized means of K are relatively low with weak and steady localized variances of K, and localized means of K generally decrease with decreasing NEDI under the dry regime. Such features cannot be found with the use of common drought metrics like sc-PDSI, SPI1, and SPI12, and there is no clear transitional pattern that separates the wet and dry regimes identified by these drought indices (Figure 1). Figure 1. The localized mean (left axes; blue lines) and the localized variance (right axes; green dots) of normalized ET strength (K) calculated in individual drought index windows. Results were aggregated from 60 AmeriFlux sites (489 site years in total) across 8 different vegetation types for each of the investigated drought indices. Therefore, drought conditions suggested by NEDI can be used to optimize irrigation plans and facilitate studies interested in ecophysiological responses to water availability, as they reflect ecosystem responses to drought. The framework developed in Chang et al. (2018) should be able to apply at any spatial scales since NEDI calculation does not involve any site-specific parameters or ecosystem dependent properties. Ecosystem drought severity can thus be assessed with proper air temperature and precipitation datasets at user-defined study regions, as they are the only intrinsic variables needed in NEDI calculation. The low data requirement and simple nature of NEDI make it straightforward for application to different scientific disciplines or drought detection and analysis at various spatial and temporal scales. The feasibility of applying NEDI will provide a valuable tool for users and decision makers to modify water management practices accordingly. These findings are described in the article entitled A drought indicator reflecting ecosystem responses to water availability: The Normalized Ecosystem Drought Index, recently published in the journal Agricultural and Forest Meteorology. This work was conducted by Kuang-Yu Chang and Kyaw Tha Paw U at University of California, Davis, Liyi Xu at Massachusetts Institute of Technology, and Gregory Starr at University of Alabama. Kuang-Yu is a research scientist at the Lawrence Berkeley National Laboratory, Climate and Ecosystem Sciences Division.